It’s amazing that people are still trying to cash in on the success of The Nightmare Before Christmas. One can only wonder when the mediocre musical that became one of the world’s mightiest trends will tire. Next in line to replicate the film’s success (following the structurally catastrophic Corpse Bride) is Coraline. The story, based on a novella by fantasy-horror guru Neil Gaiman, is predictable and bland: a little girl isn’t getting enough attention from her parents, so she flees off to a magical wonderland that simply is too good to be true. The story is one we’ve seen dozens of times (Alice in Wonderland, for starters) and every time it plays out to painfully similar results. In this newest incarnation, the face behind the curtain is much darker than the one found in Oz, but this doesn’t stop the audience from growing tired less than halfway into the film. This is because the narrative drags on at an agonizingly slow pace. The filmmakers don’t take the initiative to make the audience care about the characters involved, instead, they build supporting characters as irresponsible and grotesque, the main character to be spoiled and self-centered, and the fantasy characters to be just that, fantastic (and I use this word in its literal sense, mind you). Somehow, by the end of the film, we’re supposed to believe that the irresponsible parents and neighbors of Coraline are capable of sudden and inexplicable change, becoming able to cater to Coraline’s every whim, and we’re left to forget about the fantasy world. None of these characters are built to be interesting or captivating. Instead, they all form gimmicky clichés and caricatures of characters we’ve seen elsewhere. The film works itself up to a climax that proves to be mechanic and predictable. Coraline has to both fight the evil witch who rules the fantasy world while at the same time hunting down the eyes of a trio of murdered children in order to set their souls free. Each eye is captured in the space of about five minutes, seeming very much as if the writers and filmmakers had grand visions but just got bored of the project. The battle against the evil witch is equally unimpressive and leads out to the ultimate happy ending everyone expected, despite the fact that no one in the story deserved such an ending. The animation style utilized in the picture is the same type of high-speed photography stop motion used in Nightmare Before Christmas. However, the method is much more interesting as an artistic endeavor than it is as an actual vehicle for a film. Modernly, the method looks choppy and uneven, hindering the flow of the story and looking horribly unprofessional, especially when stacked next to smoothly illustrated pictures such as Bolt. The film also utilizes a new form of 3-D motion, which is the revolutionary digital “Real-D” that’s quickly becoming the standard in movie theaters all across the nation. Unfortunately, the 3-D is wholly unimpressive and underused. It seems the filmmakers and technicians are unfamiliar when it comes to filming in 3-D and fail to use it when it counts. Instead, they try to cash in on a few close-shots of flying birds and a scene featuring a spinning ball. One of the cardinal mistakes made in animated films is hasty casting. For some reason, executives in charge of casting these films feel the need to expand the budget by pulling in big Hollywood names completely unaware that it doesn’t matter; kids don’t look for names or specific actors when picking their films. As a result, the audience almost comes to expect inappropriately lined voices in animated roles. One of Coraline’s best features is that the casting is near immaculate: each and every voice is fitting to the role and effective to the picture as a whole. Overall, though, for a film promoting itself as a children’s fairytale, the story comes off too dark for most young children. In several scenes, the evil witch beckons Coraline to cut out her own eyes and replace them with black buttons. This motif is common throughout the film as all the characters in the fantasy world have buttons for eyes and in one scene, Coraline befriends a trio of children who fell into the trap, cut out their eyes, and promptly died. Even the “fairytale” aspect of the film is undershot, as there’s no moral, no lesson, and no one gets what they deserve. 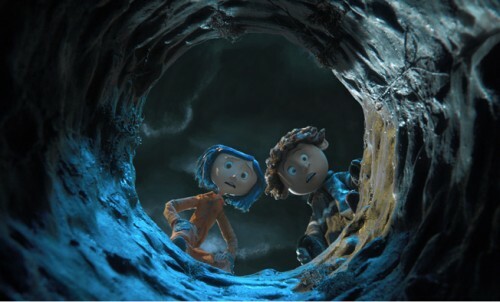 So the bottom line is that Coraline is too dark and moody to be enjoyable for kids – in fact, I can predict apprehensive youngsters having nightmares over this one. And for the adults? Well, it’s just too bland and dated for them to get much enjoyment out of it, either. If you see it, see it get a glimpse at an out-dated filmmaking method and a criminally underused new medium that should be revolutionary. But aside from that, you won’t get much out of this film.